A 1938 aerial of 'Clayton', originally the Stephen Lloyd Bryce estate designed by Ogden Codman Jr. c. 1901 in Roslyn and for many years the Childs Frick estate. Click HERE and HERE for more on 'Clayton'. Photo from Stony Brook University's Digital Archive. The mile long drive to the house must have really gone over with guests. How many other estates had a mile long drive and are any of these drives still intact? I was always under the impression the Childs Frick was disinherited. Something to do with Taxidermy, I think. The loop at Caumsett is 3 miles long making it 1.5 miles to the house. Great for bike riding. 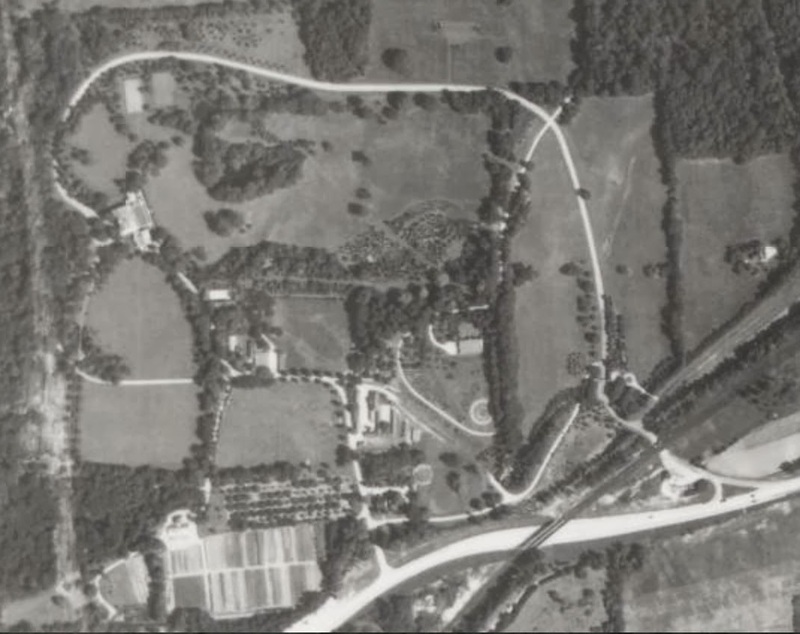 Looking at Zach's link to Bing -- the small formal garden next to what is now the parking lot doesn't appear in the 1938 aerial ... unexpected. Any proper English estate worth its salt would've had a meandering approach road that would been longer. The American estates of the Gilded era emulated the same. With specimen trees, meadows, intentionally limiting glimpses of the manor house, and perhaps an arched bridge over a brook that journey on the property would've been part of the grand impression. In fact it was a treat. If only the wealthy of today would revel in having longer approach roads. I maybe perhaps in the minority, but I loathe a manor house just 30-yards away from the public road. That's all well and good and to be expected in congested hamlets but if you have the money and are out in the country buy some privacy. Kudos to the people responsible for the first class restoration of the Frick formal garden and the woodenr trelliage, one of the few remaining examples on Long Island of the once many trellis structures found in similar gardens.